Ok, I guess I should call this a “french-style” Omelette since I’m neither a cook nor french and probably not qualified enough to teach others how to cook eggs. French Omelette isn’t like the American or the Spanish Omelette because it isn’t cooked as long and it also is very thin and usually not filled with Chorizo Sausage (I guess you could though if you wanted). It isn’t the easiest thing to cook but once you have mastered your first “omlette française” (said with an extreme french accent and accompanied by a flourishing hand gesture) they will only get better. Des Questions? Non? Alors, je vais commencer avec cette Omelette magnifique! Crack both eggs into the mixing bowl, add the seasoning how you like it and add just a drop of water. Mix the ingredients together using a fork until it’s a solid yellow. Put the pan on the stove and turn it on on a medium to high temperature. Pour in a little oil and butter and wait for the two to melt. When the pan is fully heated, put in quite a lot of butter and when it starts to froth pour in your egg mixture. Leave the egg in for about 5 seconds and then, using your spatula, push the egg in the middle from one side of the pan to the other. 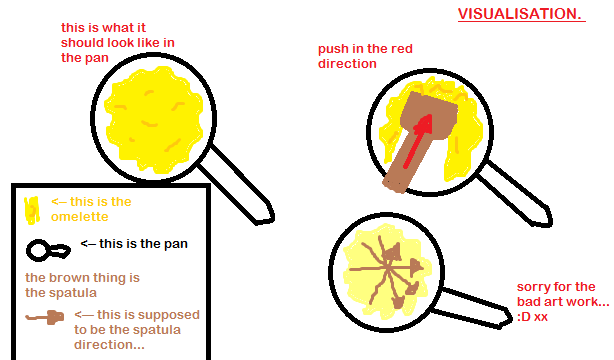 Let the runny egg fill the hole you just created by moving the pan. Repeat this step in a flowery pattern until no more runny egg is there to fill the holes (If you want any extras on your Omelette, add them now). Turn the Omelette over and let the other side sizzle for 6-8 seconds. There you have your very own french-style Omelette! *this is not my picture! Previous Mmmmonday… 5 Minute Chocolate Cake! :) Next Travelling Europe through the medium of Ice Cream.